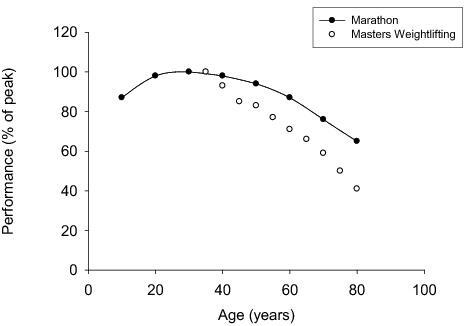 It’s no secret that declines in performance occur with age. In fact, the mantra I hear over and over is, “Once I reached 40, everything changed.” And, for those of you 50 and beyond, the sentiment about diminished performance is even stronger. 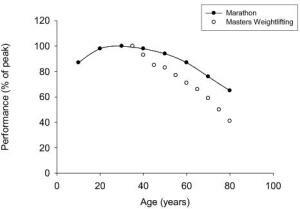 Mounting research into Master’s athletes, and triathletes in particular, has delved into the particulars of the changes in performance with age. Since there are decreases in VO2max over time, we might question what happens to the lactate threshold (LT). LT denotes the point at which the muscles begin to become progressively more inefficient in terms of oxygen use, and begin to use greater amounts of carbohydrates for fuel. “LT is a very good predictor of exercise endurance and exercise performance, in some ways more important than VO2max per se.” said Dr. Skiba, “Importantly, it does not seem to decline in the same way with age, especially in athletes who remain fit and well-trained.” A healthy dose of LT intervals incorporated into your training program is a highly efficient way to delay drops in LT. These types of intervals are much longer in length than VO2 max intervals and can last from 10-20 minutes for about 40-60 minutes of total work depending upon one’s level of fitness and the time of year. The timing of this is great. I was pondering a blog post of my own before I saw yours called “You CAN get faster after 40! !” I'm having a breakthrough year of racing at age 45 with top bike and run splits at speeds I'd never had before. I love the ladder analogy!! Since I never swam/biked/ran until 41. I continue to see gains. I'm kind of glad I don't know what kind of numbers I could have put up in my late teens/early 20s. My explanation is that while my VO2 max may be dropping, I am also smarter about nutrition, training, and recovery, and am more focused and tougher than I was even 10 years ago. So physiological declines can be offset somewhat. Folks should never stop reaching!! You are such a great example of that!! Keep it up, Joanna! !